BMC Racing Team has won the third stage's team time trial at the Tour de France. This stage victory also gave Greg Van Avermaet the leader's jersey. The third stage of the French race was a 35.5-kilometre-long time trial in Cholet. Mitchelton-Scott was the first team to finish and to set a time of 38 minutes and 55 seconds. The next team to cross the finish line was Team Sky, who stopped the clock at 38 minutes and 50 seconds, five seconds faster than the Australian team. Movistar finished next and set a time of 39 minutes and 40 seconds, 49 seconds behind Sky. 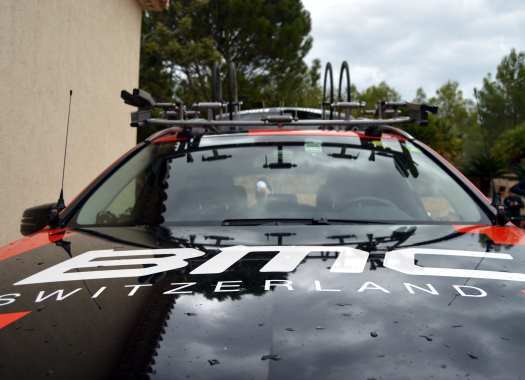 BMC, which was planning to win back some time for Richie Porte, was the next team to set the best time. The American formation stopped the clock at 38 minutes and 45 seconds, beating Sky by four seconds. EF Education First completed the circuit in 39 minutes and 21 seconds, while Groupama-FDJ did it in 40 minutes and 28 seconds, one minutes and 42 seconds slower than BMC. Katusha-Alpecin finished in 39 minutes and 39 seconds, Bahrain Merida in 39 minutes and 52 seconds and LottoNL-Jumbo in 40 minutes and 2 seconds. At the halfway point of the course, Peter Sagan couldn't follow his Bora-hansgrohe teammates and was dropped, which also made him lose the Yellow Jersey. Quick-Step Floors was one of the strongest teams of the day and finished the course in 38 minutes and 53 seconds, which meant that Greg Van Avermaet was to take the leader's jersey. The Belgian had already worn the Yellow Jersey in 2016 at the 5th, 6th and 7th stages.